Wasserman Bag provides packers with the ability to make produce more appealing with mesh bags; enhance the color of your ptoduct, allow maximum ventilation and let your customers experience the sweet aroma of your produce. Leno mesh and the drawtape provides a strong and easy to close package. 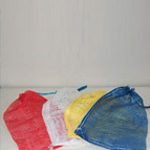 Stock and custom print bags are available in a variety of sizes, mesh gram weights and colors. Our ability to help you brand your product is based on years of experience in the business. We know what information is required and we know what stands out to your customers. If you have any questions about our products or if you can’t find what you’re looking for in our listings, call us at 516-681-5900 today! We’ll answer your queries as soon as we can and we look forward to serving you. 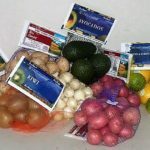 Typical applications: Small Potatoes, Pearl Onions, Chestnuts, Citrus, Kiwi, Avocados, etc. We are a trusted supplier of high quality packaging solutions for various types of products. If you need mesh bags, produce packaging, or any other kind of packaging for your company's products, count on Wasserman Bag and we'll take care of the rest.